When someone says Cinderella, what do most people think? Weak, pushover, pathetic, damsel in distress? Perhaps those are accurate, from a certain viewpoint. Perhaps she is a terrible role model for young girls. It’s easy to see her as moping around waiting for her prince to come rescue her. But consider her story from a different perspective – a perspective that’s hard to see beneath all the girl power rants, a perspective I believe Kenneth Braunagh captured well in the live action film – and maybe you’ll begin to see her a little differently. Hollywood has become obsessed with a specific type of heroine. Sure, she might look a little different from movie to movie, but at her core she’s much the same everywhere. She’s outspoken, sometimes even opinionated. She doesn’t run from a fight, whether she knows how to fight or not. She doesn’t give up on what she wants, no matter what obstacles land in her way. Strong women like Eowyn, Wonder Woman, and Buffy, would never put up with Cinderella’s treatment. The “strong woman” wouldn’t have stayed. Heck, the “strong woman” would have found a way to kick her stepmother and stepsisters out of the house and made her own way in the world. Probably sans prince, too. And that’s great. But that does not make Cinderella weak. Consider the story, for a moment, from the stepmother’s point of view. She’s lost not only one, but two caring husbands. Men she loved, even if she didn’t always show it well. Try as she might she cannot keep her grief from poisoning her daughters’ attitudes. And, as if that doesn’t make it hard enough to forget her grief, she has another daily reminder of it in the form of her second husband’s daughter. Now, if we were to cast the stepmother as our “strong woman” would it not seem reasonable that she would find it difficult to be kind to Cinderella? And more than that, Cinderella refuses to rise to the bait. No matter how awful the stepmother’s grief makes her, Cinderella does not respond in kind. Is it too much of a stretch to suggest that the stepmother may have been itching for a fight? After all, how many of us wind up hurting the ones closest to us when we’re in pain? The truth is, I have seen this very story line in many books and movies. Did not Anakin try to kill his own son? Did not Callahan try to kill Alastair Krei and Hiro? Did not Gollum threaten to kill Bilbo and try to kill Frodo as well? Each of the heroes had every opportunity to kill their adversaries. Some might say they had every right to. And yet, each found it within himself to show pity. Luke fought to save his father. Hiro risked his own life to save Callahan’s daughter. Frodo took care of Gollum, saw the simple hobbit he was before the ring corrupted him. They all chose compassion over anger. So why is Cinderella’s compassion for her stepmother and stepsisters seen as weakness? Why are Callahan, Anakin, and Gollum worthy of compassion, but Cinderella’s stepmother is not? This is why Cinderella’s strength and courage is so hard to recognize. If we fail to see the grief and hurt that drives her stepmother’s anger and hatred, then we also fail to understand why Cinderella chooses to endure their treatment rather than give as good as she gets. We expect her to be a “strong woman,” fighting for freedom or justice like Eowyn, Wonder Woman, or Buffy. So we are disappointed when she does not live up to those expectations. And that disappointment blinds us to her real strength. In a world where standing up for oneself now often means tearing others down, Cinderella shows us another way. As the world becomes more and more individualistic, Cinderella shows us how to look outside ourselves. 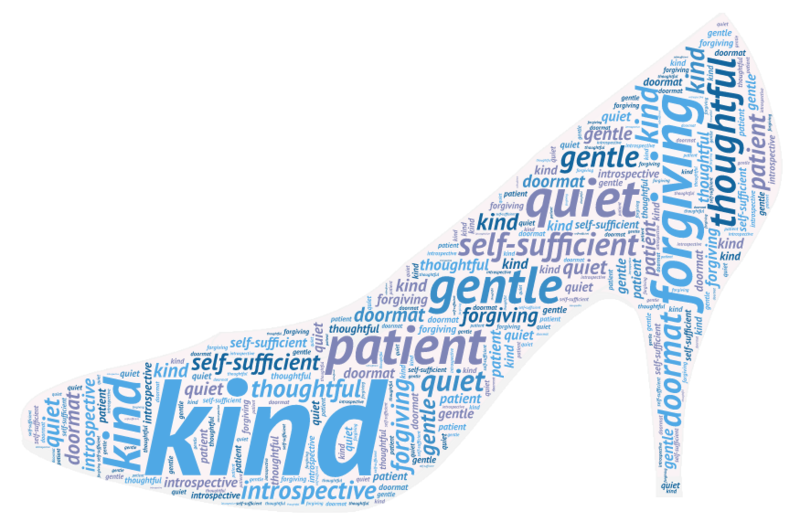 While strong women like Eowyn, Wonder Woman, and Buffy encourage us to fight adversity, Cinderella shows us how to hold onto compassion in the midst of it. Cinderella shows us how to see the hurt the bullies hide. May I make one more comparison? Maybe to another princess that many find much braver? Someone who saw a man worth loving within the ferocious body of a beast? It’s odd that Belle is seen as brave while Cinderella is considered weak when they both model the same lesson. The primary difference is that the man inside the beast is easier for the audience to see than the heart-broken woman inside the stepmother. While Belle had to learn to see what lay beneath physical ugliness, Cinderella was able to see what lay beneath hurtful words and actions from the beginning. And seeing the pain beneath hurtful words is not only harder to do, but harder to recognize in other people’s situations. It is admirable to stand up for ourselves and to fight for what we want. But not every conflict should be solved through confrontation. Not every bully needs to be locked up. Like the hundreds of cops who have turned lives around by replacing knives or guns with a friendly cup of coffee instead of a pair of cuffs, Cinderella chose to treat her stepmother and stepsisters the way she wished them to treat her. She was able to see the grief stricken woman inside her stepmother. She was able to see the hurting, confused girls inside her stepsisters. I’d like to think that Cinderella’s kindness helped them to find a better way of living. That perhaps they went on to become kinder individuals because Cinderella was kind to them when they deserved it least. And that is what makes Cinderella brave. She chooses to treat everyone in her life with respect, whether they deserve it or not. She chooses to be kind when she has every right to be angry. How often can we say that of ourselves? So, before you add to the litany of complaints regarding this timeless fairytale, consider that not everyone is cut out to be a “strong woman.” Consider that some girls might need a Cinderella to show them that it’s okay to prefer kindness to ambition. Consider that someone who looks like a pushover, might just be a lot stronger than you realize.